Gabi and Elspeth are Scots Dumpies - one of the rarest breeds in the UK. Scots Dumpies originated in the Highlands and were thought to be extinct by the mid 1970s. Luckily, someone found a flock of these amazing birds in Zimbabwe and the breed is making a comeback. They're really cute hens with short little legs. 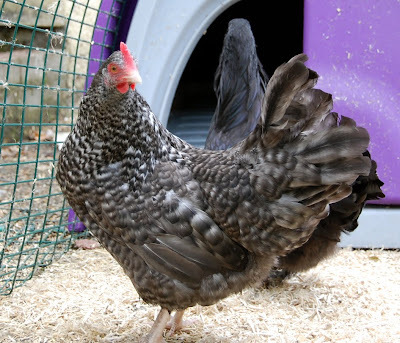 Gabi is a black variety with a beautiful green sheen to her feathers. Elspeth is a cuckoo. Both should lay a tinted cream-coloured egg. They're already the best of friends, too! Awww... look at those cutie pies! Fascinating to read about your hens. 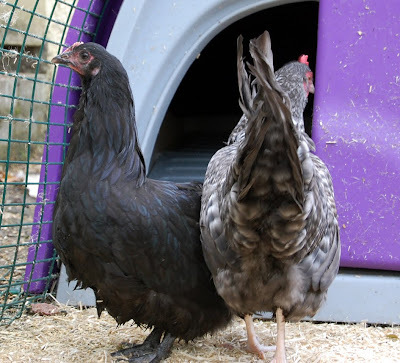 I never thought there are rare breeds of hens and other colors than white and brown in eggs until reading your blog! I'm in love!! They're beautiful! MP -- we have foxes around here, too. A good electric fence would solve your problem. Teresa, I don't think I've ever congratulated anyone for having a broody hen, but yay! I hope you get lots of girls. BTW, I forgot to tell you thanks for the little history on your hens' breed. I love reading stories of heritage breeds making a coming back! Gorgeous! I'm loving their home too, bright and colorful! Teresa, after learning a bit more about endangered breeds, we're going to keep them in our flock from now on. Finding them can be a challenge, though! Gabi, they are sweet birds. Little Gabi is becoming more confident every day. Hi Michelle! That's the little Eglu. They'll move over to the big hen house once the other hens have accepted them. Must admit I'd never heard of Scots Dumpies - lovely chooks! I wrote to Jill back when I first considered getting hens. She's lovely and super helpful! Teresa, that's too bad. :( Do you have an incubator? We've waffled on getting an incubator: on the one hand, it's so much more reliable; on the other hand, we like having a broody hen take care of the chicks and teach them how to forage and all that.